Many of us are thinking of Christmas presents, so here’s a little recommendation from me, priced at just £16. Sam Larner (1878 – 1965) was a fisherman who lived at Winterton who late in life became legendary for the quality of his singing of old songs, and his extensive repertoire. This pair of award winning CDs of recordings made by Ewan MacColl and Peggy Seeger of his songs and reminiscences is a gem that includes 65 songs and fragments, plus some illuminating spoken passages. At 149 minutes, the collection is said to amount to pretty well all of old Sam’s recorded repertoire, and gives a powerful impression of his life and times, and of course his character and the way of speaking on the East Coast in years gone by – for when I hear him speak, it could be my East Coast grandparents talking. Read the very informative CD booklet and check out the review by an expert in traditional songs. I love to listen to him, for his way of speaking reminds me strongly of my grandparents, who were also Eastern counties folk. 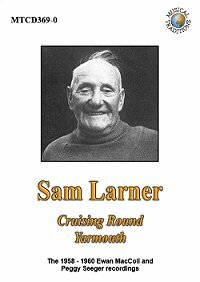 For more posts mentioning Sam Larner, click here.